Owing to rich experience, we manufacture, supplier and exporter premium array of cotton Embroidered Bedspread.We offer this bed sheet at affordable prices. 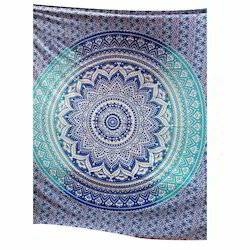 Mandala Handmade Wall Hanging Home decor Hippie Art Tapestry With the help of our skillful professionals, we are engaged in manufacturing and supplying Mandala Printed Tapestry to our respected clients. We are providing a bed sheet, and 2 matching pillowcases. The round indian mandala design is very popular right now and a great way to add color and pizazz to a room. Makes a unique gift for birthdays, housewarming, valentine's day, or christmas. It's also a great gift for college students. We are successfully meeting the varied needs of our patrons by offering a wide gamut of Printed Wall Tapestry as per their precise needs. We have marked a remarkable position in the market by offering the best quality array of Mandala Bed Sheet. Ombré technique has been used a long time. Ombré fabric printing, using a special printing block called an 'ombre' or 'rainbowed' block. Cotton reversible same printed duvet cover . We are manufactured jaipur cotton printes duvet cover and bed sheets Tapestey and rounds .